Drake's patented Eqwader™ gear revolutionized waterfowl clothing when we introduced it almost ten years ago, and it continues to be one of our most popular styles today. The all new EqwaderPlus Quarter-Zip and Full-Zip raises the bar for innovation and hunting performance. Eqwader Plus technology combines our most effective Instinctive Features™ with a new design that delivers increased function in the field. 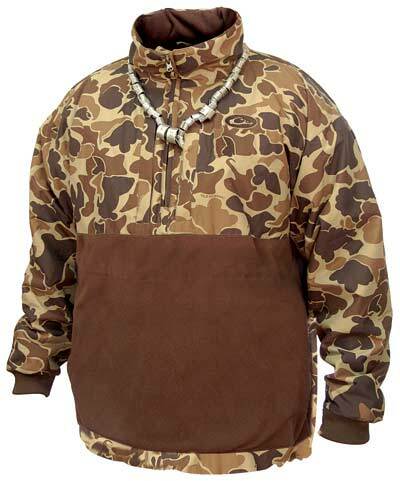 Q: I want the jacket with part camo and part fleece as pictured but when I click on this item it has another pic of a full camp jacket and I want to make sure in Gettjng the one with part camo and part fleece.. Can you lmk which it would send me for the drake old school camo full zip jacket? A: Thank you for bringing the Drake Full and Quarter Zip styles to our attention as we previously had these listed incorrectly with conflicting product information. We have now edited the product options to display the correct pictures with each camo in the full and quarter zips. You should be able to easily discern between the choices. Let us know if you have any additional questions. Q: What is the top part made of?